Hoo boy. I saw a lot of people blaming Myers and Miller for the lone goal the Sabres surrendered tonight in their shot-fest with the Ottawa Senators. About that. Let’s excuse Miller for a couple reasons. 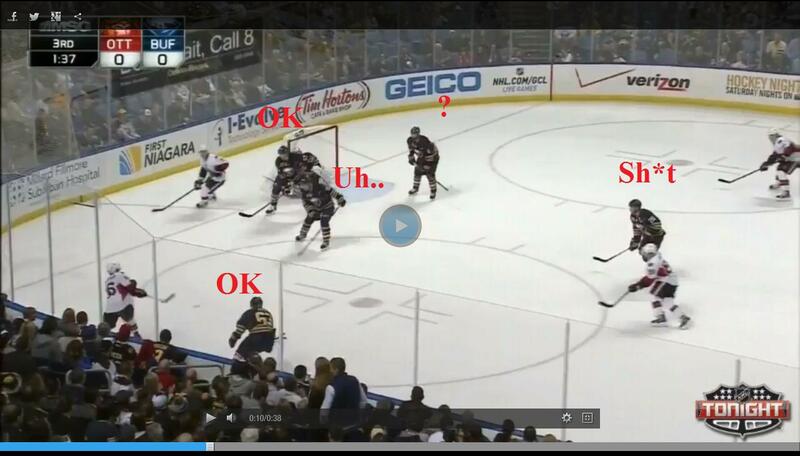 One, the goaltender is not the problem when you surrender over 40 shots and don’t score yourselves. Two, I don’t know what else you can expect him to do in an effort to get all the way across the goal to defend against a good shooter in Karlsson. Zemgus Girgensons and Brian Flynn – Like an angry Latvian and his teddy bear. Or something. Thomas Vanek – Nine shots on goal, a force all night, just couldn’t score. Christian Ehrhoff – 27 minutes. Cody Hodgson – Just does not seem to know how to play in his own end. Mike Weber – Lifeless on the goal. Tyler Ennis – I don’t know what to make of Ennis. I know he has talent, but it sure doesn’t translate into results. Drew Stafford – Demoted from the top line, had two shots on goal on a night when everyone was getting shots on goal. Just ugly.